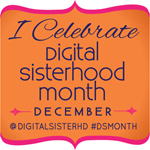 This year Digital Sisterhood Network (DSN) is hosting the third annual celebration of Digital Sisterhood Month from December 1 to December 31, 2012. “Creativity + Great Health = Fierce Living Women” is the theme. Online events featuring the announcement of the Digital Sisters of the Year, Digital Sisterhood Leader profiles, giveaways, guest blog posts, Digital Sisterhood Radio interviews, and Twitter chats will be held. Offline events will be held in Washington, D.C. and New York City. See the schedule below. Digital Sisterhood Month 2012 Pinterest Board: http://pinterest.com/anandaleeke/digital-sisterhood-month-2012. Feel free to post the badges and use them on your blog, web site, or social media sites. They were created by Dariela Cruz of Dari Design Studio. Grab the code below. 1) December 1: DC Field Trip – TEDxAdamsMorganWomen, 1:00-6:00 p.m. Instructions: Click here to register and purchase a $35 ticket on Eventbrite (deadline is November 23). Event Description: TEDxAdamsMorganWomen is sponsoring ‘The Space Between,” a half-day presentation of dynamic speakers who will focus on how to move past dichotomous thinking and see the gray area in between. The speakers include: Nicole C. Lee, the first female President of TransAfrica; Karen Dolan, Fellow at Institute for Policy Studies; Kethia Clairvoyant, Founder at Fit for Life by KC; Shonali Burke, Vice President, Digital Media & Marketing at MSL Group; David Deal, CEO at Community IT Innovators; Nicolette Pizzitola, CEO at Compass Point Associates LLC; and George Koch, Founder and Chair Emeritus Artomatic, Inc. NOTE: Ananda Leeke, Digital Sisterhood Network founder, will attend the event from 2:30 p.m. to 6:00 p.m.
2) December 2: DC Event – Fierce Living in Fashion 15 Minute Flash Mob on U Street, 1:00-5:30 p.m. Instructions: Click here to register on Eventbrite. Follow @breaellis and @digitalsisterhd and use the Twitter hashtag #dsflashmob to obtain event updates. Event Description: Come celebrate Digital Sisterhood Month on December 2, 2012, from 1:00 p.m. to 5:30 p.m with a “Fierce Living in Fashion” event that takes you on a “15 Minute Flash Mob” tour of U Street’s amazing boutiques and vintage shops located between 15th and 16th Streets, NW, Washington, D.C. All you need are $15 or more and comfortable walking shoes. The tour will be led by Brea Ellis, a fourth generation Washingtonian and the founder of What I Wore: tip to toe, a personal style blog. Digital Sisterhood Network founder Ananda Leeke, a U Street resident, will also serve as a tour guide. The “15 Minute Flash Mob” tour will begin with a meet and greet at The Mediterranean Spot on U Street. Group members will be responsible for purchasing their own beverages and snacks. After the meet and greet, the group will visit the following boutiques and vintage shops: Junction, Legendary Beast, Zawadi, Rock It Again, Ginger Root, Dr. K’s Vintage, and Lettie Gooch. They are owned by women and people of color. Group members will be asked to spend at least $15 during the tour so that local businesses receive financial support. Also, the group will spend 15 minutes in each boutique or shop. Please note group members will be able to spend more time in the various boutiques and shops. The tour will end with a wrap up get-together at Ben’s Chili Bowl on U Street (group members will purchase their own beverages and snacks). Instructions: Listen online by visiting www.talkshoe.com/tc/42015. You can also dial (724) 444-7444 and enter Call ID 42015 to participate. There is a chat room for comments and questions. The show will be live tweeted. 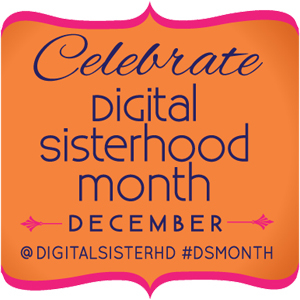 Use the Twitter hashtag #dsmonth and follow @digitalsisterhd to join the conversation. Instructions: Follow Sian Morson @xianamoy and @digitalsisterhd and use the Twitter hashtag #dsmonth on HootSuite, TweetChat, or TweetDeck to follow the conversation. 7) December 7: DC Yoga Field Trip to Embrace DC to Shawna Renee’s Embrace Flow Class (for all levels), 6:15-7:15 p.m. Instructions: You must REGISTER ONLINE and PAY in advance for the yoga classes at the studios: http://embracedc.com/classes/class-schedule. Availability is based on a first come, first serve basis. Digital Sisterhood Network did NOT make any special arrangements or secure any discounts for the yoga classes. Ananda Leeke, Digital Sisterhood Network founder, will attend the yoga class. She’ll be wearing a Digital Sisterhood t-shirt. 8) December 8: DC Event – Salon Series on DC Style, 11:00 a.m.-4:00 p.m. Instructions: Click here to register on Eventbrite. Follow @breaellis and @digitalsisterhd and use the #dsstylesalon hastag on Twitter for event updates. Event Description: Calling fashion and style bloggers, designers, enthusiasts, and professionals! Come celebrate Digital Sisterhood Month with a Salon Series on “DC Style: Past, Present, and Future.” It will feature a discussion on DC style during the past 30 years, a fashion and style blogger town hall on the present trends in DC style, and a conversation with DC designers on the future of DC style. 9) December 9: DC Museum Field Trip to the National Museum of Women in the Arts, 3:30-5:00 p.m.
About Exhibition (text taken from NMWA web site): Women Who Rock: Vision, Passion, and Power” exhibition is a provocative exhibition that illustrates the importance of women in the world of popular music from the 1920s to present day. It highlights the flashpoints, the firsts, the best, and the celebrated and sometimes lesser-known women whose artistry advanced the progress of rock-and-roll music. Featuring more than 250 artifacts and performance videos, the exhibition moves through rock-and-roll eras, demonstrating how women have been engines of creation and change. Instructions: Click here to register for the event. The group will meet at the information desk at 3:30 p.m. and will go to the exhibition at 3:40 p.m. Ananda Leeke, Digital Sisterhood Network founder, will serve as the event hostess. Everyone is responsible for purchasing their admission ticket ($10). Contact Information: You can reach Ananda Leeke via email at kiamshaleeke@yahoo.com or @AnandaLeeke and @DigitalSisterhd on Twitter. 12) December 11: DC She Writers Meet Up at Teaism, 6:30-8:00 p.m. Instructions: Click here to register for the event. Event Description: Calling all DC area women writers! Join Digital Sisterhood Network for a DC area women writers meet up group. Please bring a copy of your book or a favorite book that you would like to swap with another writer. We will also discuss our writing journeys and upcoming events. Ananda Leeke, Digital Sisterhood Network founder, will serve as the event hostess. Everyone is responsible for purchasing their own beverage and meal. The group will meet on the second level. Be sure to visit SheWrites.com, an online community of women writers. Twitter Instructions: Follow @digitalsisterhd and use the Twitter hashtag #dsmonth on HootSuite, TweetChat, or TweetDeck to follow the conversation. 15) December 14: NYC Drop By and Chat Meet Up at Argo Tea, 4:00-6:30 p.m. Event Description: Calling all NYC area digital sisters! Drop by and chat with Ananda Leeke, Digital Sisterhood Network founder at Argo Tea. It’s informal. There’s no need to make an appointment. Just come on by and chat about what you are working on, any lessons learned from 2012, and plans for 2013. Everyone is responsible for purchasing their beverages and snacks. About Exhibition (from the Brooklyn Museum web site): Brooklyn artist Mickalene Thomas is best known for her elaborate, collage-inspired paintings, embellished with rhinestones, enamel, and colorful acrylics. Her depictions of African American women explore a spectrum of black female beauty and sexual identity while constructing images of femininity and power. Origin of the Universe, Thomas’s first solo museum exhibition, highlights recent bodies of work that examine interior and exterior environments in relation to the female figure. Their settings are often inspired by her 1970s childhood. Instructions: The group will meet between 11:30-11:40 a.m. in front of the Mickalene Thomas: Origin of the Universe exhibition on the fourth floor in the Morris A. and Meyer Schapiro Wing of the Brooklyn Museum. Ananda Leeke, Digital Sisterhood Network founder, will serve as the event hostess. Everyone is responsible for purchasing their admission ticket and any beverages or snacks in the Museum Cafe. 17) December 17: DC Yoga Field Trip to Tranquil Space for Kimberly Wilson’s Yoga & Meditation Class, 8:00 p.m. 9:15 p.m. Instructions: You must REGISTER ONLINE and PAY in advance for the yoga classes at the studios: http://www.tranquilspace.com/yoga/schedule.html. Availability is based on a first come, first serve basis. Digital Sisterhood Network did NOT make any special arrangements or secure any discounts for the yoga classes. Ananda Leeke, Digital Sisterhood Network founder, will attend the yoga class. She’ll be wearing a Digital Sisterhood t-shirt. 19) December 20: “Sweet Treats: Coffee, Tea and Dessert” Meet Up at the Mediterranean Spot, 7:00 p.m. to 8:30 p.m. Event Description: Ananda Leeke, Digital Sisterhood Network founder, will host an open discussion with women in social media and tech on how to use the power of creativity in their digital experiences, interactions, and work. Everyone is responsible for purchasing their beverages and snacks. Beverages (coffee, tea, hot chocolate, chai, apple cider, lattes, frappuccinos, smoothies, sodas, juices and bottled water) cost $1.00 to $4.50. Desserts (cakes, pies, brownies, baklava, muffins, cookies, and croissants) cost $1.99 to $3.99. We are too! Thanks for commenting. Look forward to meeting you at the DC events! Glad you will be participating in #DSMonth! I hope I’m in DC during the holidays in time to make the U Street event. I plan on bringing a few social media ladies! Yay! It would be great if you can make it to the U Street events. Wish I was in DC to participate…Great initiative to support Small Business on December 2. I will be listening on the Radio Interviews…. Thanks for the #Digitalsisterhood love and support. 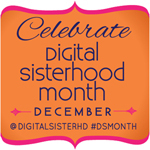 Happy you will be listening to the #DSMonth interviews on Digital Sisterhood Radio. So great to meet you at DC Rails Girls. This is awesome!!! Hi Emily. It was great to meet you too. Thank you for all you do to make Rails Girls DC a thriving and supportive community.